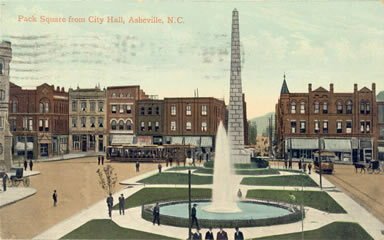 Pack Square from City Hall, Asheville, N.C.
been dedicated in 1897, and the water fountain in the foreground. 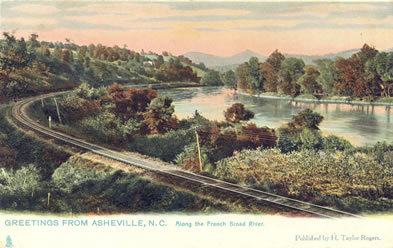 This card was postmarked 1909 from Asheville, N.C.
"Asheville is the metropolis of western North Carolina. It is the social and commercial capital of the exquisite “Land of the Sky.” Beautifully situated at the confluence of the lovely Swannanoa with the historic French Broad River, in the very center of a vast plateau, with a salubrity of climate unsurpassed in the world and with an environment of magnificent mountain and sylvan scenery, it has become one of the most notable of international resorts. It extends a charming welcome to guests from all sections at all seasons of the year. "Nestled in the heart of the Southern Appalachians and cradled by the Black Mountains and the Great Smokies, lies the Asheville Plateau. It would appear as if some mighty force of Nature had withdrawn the great mountains, leaving an undulating plain – one of the fairest spots that ever fell under human gaze..."
The Greater Western North Carolina Association’s tour guide, Information to Visitors Concerning Greater Western North Carolina (Asheville, N.C.: Inland Press, 1913), described the Swannanoa-Berkeley Hotel, in Asheville, N.C., as being one of “the oldest and best-known hostelries, but keeping pace with every advance in accommodation and convenience for its patrons . . .” It continued by noting that the hotel “is today a strictly high-class American plan hotel, with hot and cold water or private bath in every room; electric elevator, steam heat; local and long distance phone; large airy and comfortable bed-room, and excellent cuisine. . . . It has a spacious and handsome ball-room, which has been the scene of many notable gatherings and the headquarters for many conventions from this and adjoining states; and the beautiful tiled office, lobby, waiting and lounging room, with its old-fashioned fireplace, is one of the finest in the South. It pays especial attention to families and diligently watches for the comfort and care of its patrons.” Situated a block away from the city’s main public plaza, Pack Square, the hotel enjoyed nearby electric car service in addition to its other amenities. "And a glad welcome it is that is extended to all. The transportation facilities, supplied by the Southern Railway, to this city are unexcelled. Metaphorically, it is a hub, the spokes of which are the various divisions of the Southern Railway which radiate into it. Asheville is the common terminus of the divisions running from Salisbury, Spartanburg, Murphy and Morristown, those cities, in turn, being the outward termini located on the circumference of the imaginary circle which encloses the “Land of the Sky.” Southern Railway trains arriving at Asheville have through Pullman cars from New York, Philadelphia, Baltimore, Washington, Richmond, Norfolk, Cincinnati, Lexington, St. Louis, Louisville, Memphis, Chattanooga, Knoxville, Jacksonville, Savannah, Charleston, Columbia; also through Parlor Car Service from Goldsboro and Raleigh. For accommodation of Summer visitors each season, there are additional through Pullman Sleeping and Parlor Cars from Charleston, Savannah, Augusta, Macon, New Orleans, Mobile, Montgomery, Atlanta, Birmingham, and from other points. Direct connections are made from and to all parts of this country. The Southern's train service is as complete and luxurious as energy, ability and money can make it." 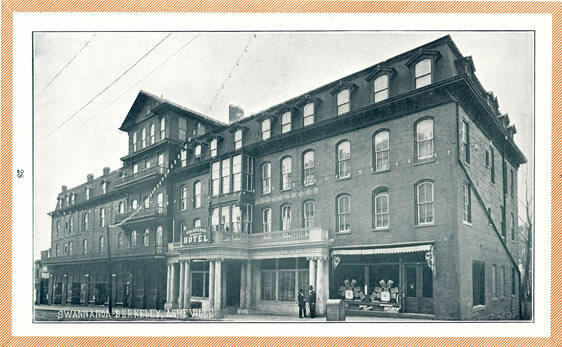 This rendering from an elevated perspective of the Margo Terrace hotel provides a juxtaposition of various modes of transportation available in Asheville, with an automobile seen in conjunction with a horse and carriage at the bottom center and an the electric trolley visible to the left. The tour guide issued by the Greater Western North Carolina Association, Information to Visitors Concerning Greater Western North Carolina (Asheville, N.C.: Inland Press, 1913), remarked that Margo Terrace was “[l]ocated in the very heart of the city of Asheville, at the intersection of Haywood Street and North French Broad Avenue . . .” The guide’s description continued by indicating that it “contains sixty bed-rooms and forty-five private baths; is elegantly furnished, and affords accommodation for 125 guests.” The hotel ceased operation in the late 1920s and was later demolished. This postcard was postmarked July 29, 1918. "The welcome extended visitors to Asheville is on a parity with the delightful experiences they have enjoyed en route to the city. They find a thoroughly equipped, modern city of 30,000 people, with every urban comfort, convenience and luxury that the fastidious could desire. . .
"That part of the city devoted to business is constructed about the public square. There stand the quaintly picturesque old court house, several modern and handsome public buildings, the Legal Building, the offices of two excellent daily newspapers and business houses representing every branch of commercial and industrial activity. . .
"Asheville is equipped with a first-rate electric street railway system, the cars of which traverse the principal thoroughfares and connect the business center with many points of interest and beauty in the suburbs. It has a good auditorium at which only the best attractions are booked, several admirably managed social clubs, many beautiful and commodious churches, a fine golf course of eighteen holes, an art gallery and an excellent public library of 12,000 well-selected volumes. . .
"Magnificent hotels - modern, thoroughly equipped and well managed - are an important feature of this wonderful resort. The elegance of their appointments, the excellence of their service and the exquisiteness of their environment have established their standards as among the highest in this country. In addition, there are scores of good private boarding houses and many lovely cottages suitable for light housekeeping. . ."
Greater Western North Carolina Association. Information to Visitors Concerning Greater Western North Carolina. Asheville, N.C.: Inland Press, (1913). Greenberg, Sue and Jan Kahn. 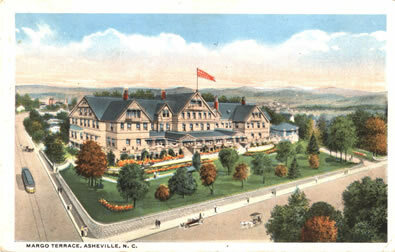 Asheville: A Postcard History. Dover, N.H.: Arcadia, 1997. McDaniel, Douglas Stuart. Asheville. Charleston, S.C.: Arcadia Pub., 2004. Massengill, Stephen E. Western North Carolina: A Visual Journey through Stereo Views and Photographs. Charleston, S.C.: Arcadia, 1999. North Carolina Good Roads Association. Road Maps and Tour Book of Western North Carolina. [Raleigh, N.C.? ]: North Carolina Good Roads Association; in co-operation with the State Highway Commission, 1916 (Lynchburg, Va.: J.P. Bell). Sondley, F.A. (Forster Alexander). History of Buncombe County, North Carolina. Asheville, N.C.: Advocate Pub. Co., 1930. Swaim, Douglas, ed. Cabins & Castles: The History & Architecture of Buncombe County, North Carolina. City of Asheville, County of Buncombe: Division of Archives and History, North Carolina Department of Cultural Resources, 1981. Ward, Doris Cline, ed., Charles D. Biddix, associate ed. The Heritage of Old Buncombe County. Asheville, N.C.: Old Buncombe County Genealogical Society, 1981.